East West Infiniti (Pvt) Ltd offer TV Transmitter product line with high performances and reliability, ideal for the world market of Digital and Analog TV Transmitters. 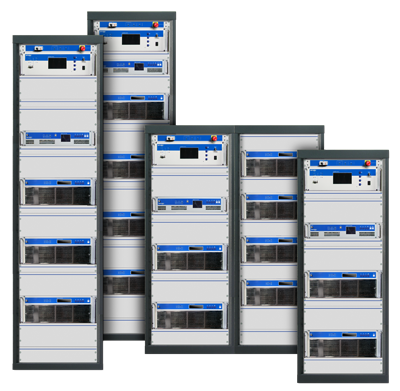 We supply TV transmitters , based on the latest generation solid state RF LDMOS transistors , and the new multistandard/dual cast exciters offer both simultaneous analog and digital transmission capabilities. They combine the RF and Digital technologies in a compact broadcasting platform for all of the world standards of analogue and digital television. TV Transmitter are aviaianle in both modular and compact configurations, carefully designed architecture, in order to make installation in any location easier; high performances in power come along with a high-performance air-cooling technology with low acoustic impact, defining a wide range of working temperatures, a high MTBF and a minimal need for maintenance. The excellent linearity and gain performances providing high efficiency, minimizing consumption and operational costs. Transmitters can self-adjust if equipped with the multistandard exciter, with Dynamic Adaptive Pre-distortion (DAP). The DAP engine of the exciter automatically detects the degradation of performances, if any, and immediately recalculates the integrated pre-distortion coefficients, thus allowing a fast recovery of the optimal working point of the transmitter. With the DAP, the output of the transmittter is constantly monitored and adjusted to assure the maximum coverage under any working condition. An optional GPS receiver allows the perfect synchronization in SFN networks (if realizable). The TV Transmitter is designed to assure a constant and high quality of service, tank to an oversized architecture of the RF section, the power supply section and the internal unbalancing loads. Every individual amplifier is equipped with a local control system, able to act immediately, and a central control system gathering in real time the working parameters of the whole transmitter and allowing a complete management, both locally and remotely. A simple interface, along with an efficient SNMP support control, allows a fast access to the control system of the TV Transmitter from anywhere in the world, using any kind of wired or wireless connection and a normal web browser on a PC, laptop, netbook or smartphone.